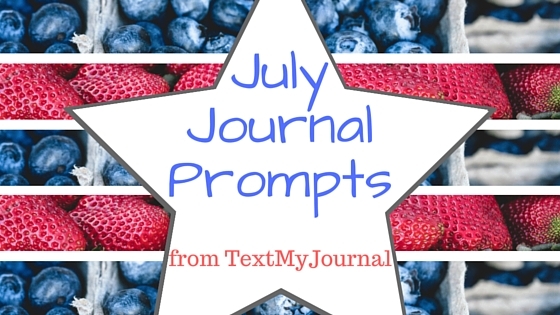 July is a favorite month at TextMyJournal. So many great activities, so much summer (in the Northern hemisphere anyway), and so much joy! In an effort to make remembering the wonder of July a little easier, we’ve created a prompt for every day in July. Hopefully one of them inspires you to remember the story you’re creating each day. What one goal will you accomplish this month? What’s the first step? Take it today! Go on a walk & collect some flowers. Press those in your art journal. Fill a page with receipts. Write little notes about each purchase. National ice cream day! What’s your favorite flavor? Call a friend. When the call is over, write down what you want to remember. What trait do you admire in your parents? How are you motivated to try new things? How did you accomplish your July goal? What would you have done differently? Like it pretty? Here you go!